Once again, an AR-15 has been used in a mass shooting. In this week's rampage in San Bernardino, Syed Rizwan Farook and his wife, Tashfeen Malik, used AR-15-style rifles in killing 14 people and injuring 21 others. 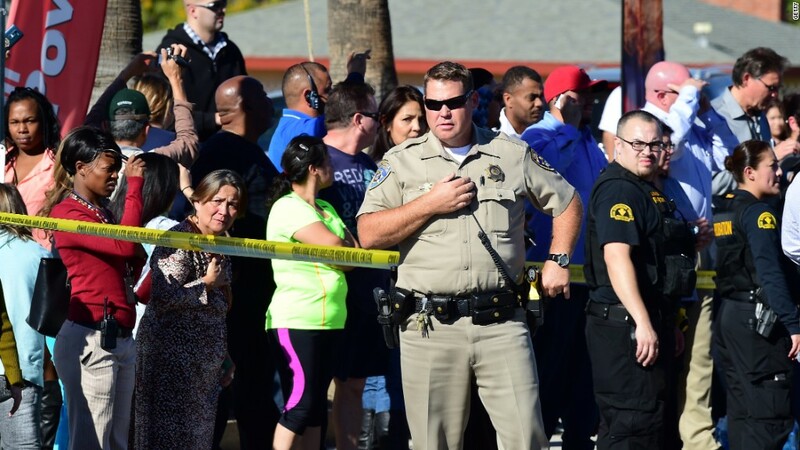 Murderers use all manner of weapons, and Farook and Malik were also found with two semiautomatic handguns. But no gun has been as controversial in recent years as the AR-15 -- a weapon first introduced in the 1960s -- and similar weapons. 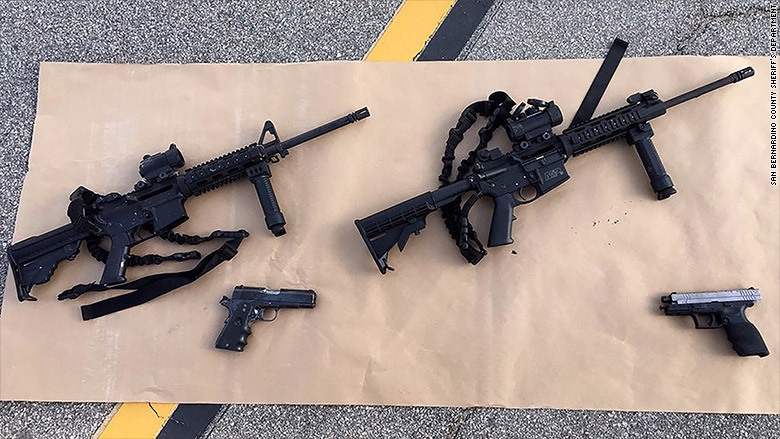 AR-15 style guns were used three years ago in the mass shootings in Aurora, Colorado and Newtown, Connecticut. The twin rampages sparked a boom in the sale of military-style weapons. "There was a 30% to 50% increase during the surge," said gun industry analyst Brian Ruttenbur of BB&T Capital Markets. The AR-15, like other tactical guns, can use high-capacity magazines containing more than 10 bullets. It's known for its ability to be customized: Sights, grips, stocks and handguards can be attached and detached like Legos. After Aurora and Newtown, buyers were driven by fears that Congress would enact federal restrictions, galvanizing the nation's gun control movement. President Obama had called for greater restrictions on the kinds of weapons used in both killings. Then, Obama's gun control bill failed to pass the Senate in April 2013 and concerns that Washington would clamp down subsided. And so did sales of military-style weapons. Today, the overall gun business is booming. The stock of Smith & Wesson (SWHC), a leading gun maker, has nearly doubled in 2015. 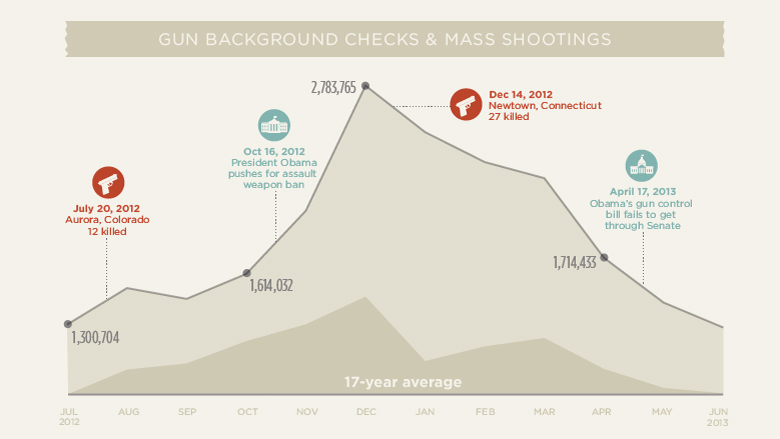 FBI background checks, a close proxy to gun sales, are on course for a record year. Experts say, however, that demand is driven by increased customer appetite for handguns, while sales of rifles have slowed. Walmart (WMT), one of the nation's largest sellers of guns, announced a few months ago that it would stop selling military-style weapons. The company cited falling sales but also indicated that it wanted to focus its guns sales on sports and hunting. "Our focus in terms of firearms should be hunters and people who shoot sporting clays, and things like that," CEO Douglas McMillon told CNNMoney. "So the types of rifles we sell, the types of ammunition we sell, should be curated for those things." The AR-15 was invented by a company called ArmaLite. The lightweight rifle, also known as the M-16, was issued to U.S. troops in Vietnam as America's answer to the AK-47 used by the Viet Cong and North Vietnamese Army. Both the AR-15 and AK-47 are still produced by Colt and Kalashnikov, the companies that own the original brands. Kalashnikov started producing AK-47s in the U.S. for the first time this year. But lots of other companies are producing AR and AK style knock-offs in factories around the world, including the U.S. Despite Walmart's decision to stop selling the AR-15, the gun and similar semiautomatic military-style rifles remain readily available. Three of the biggest chains that sell guns, Cabela's (CAB), Gander Mountain and Bass Pro Shop, advertise a selection of AR-15s on their Websites. And the weapons can be bought at small stores and gun shows. Ruttenbur estimates that about 80% of AR-15s and other military-style rifles are sold by independent "mom and pop" gun shops. But people are buying fewer of them, experts say. Ruttenbur said sales at big gun retailers are driven by hunting rifles and shotguns. The military-style rifles make up just a small portion of their sales. "AR-15s are not selling well," he said. "There's not an upswing. Long guns have been down for the last six months." This week, Democratic presidential candidates Hillary Clinton and Bernie Sanders called for more gun control. But that doesn't mean it's going to happen. AR-15s might have lost their luster for private citizens, but they're popular with law enforcement. The Nassau County Police Department, located next to New York City, just purchased AR-15s for its officers. The department said it purchased 150 Sig Sauer M400 rifles "in preparation for an active shooter or act of terrorism, similar to what we have seen in recent events.